Quarterback Lincoln Victor and receiver Darien Chase led the Titans to the Class 4A state title and are The Seattle Times State Players of the Year. Victory smells like a tropical island. With an apropos name, Lincoln Victor was adorned with a fragrant lei po’o (a crown) and lei after leading Union to the program’s first Class 4A state football championship Saturday night. Beside Victor — as he’s been for nearly a decade — was teammate Darien Chase with a lei around his neck. 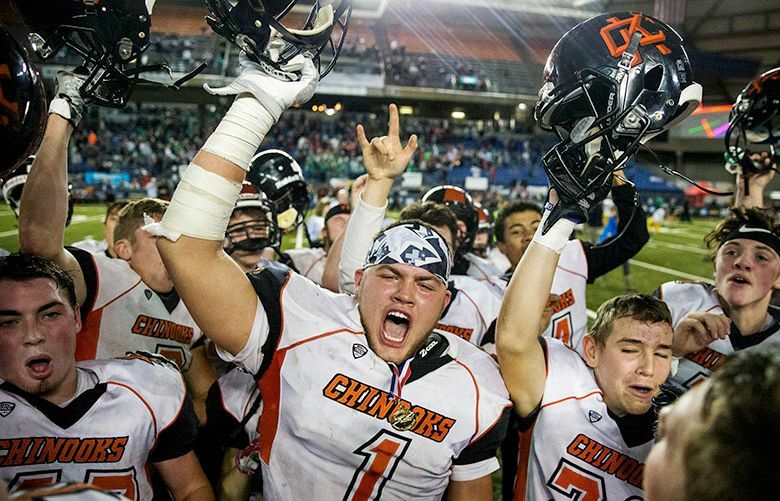 The seniors beamed as they celebrated on the Tacoma Dome turf. Childhood talk around the playgrounds of Vancouver were finally made a reality. The co-captains were an electric show through an undefeated season (14-0) where six games were decided by seven points or fewer. For their performance, Victor and Chase were selected as The Seattle Times’ Co-State Football Players of the Year. 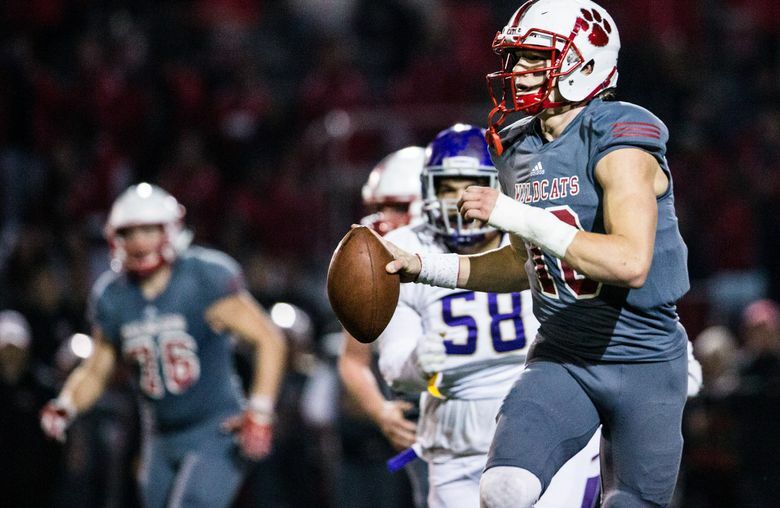 If there’s one play that epitomizes their connection, it’s the 20-yard touchdown pass in the first quarter of the title win against Lake Stevens. Chase, a 6 foot 1, 170-pound receiver, had to corral Victor’s pass inches from the right sideline as he tumbled into the end zone. They call them crazy catches. Whether with apples, balled up paper or footballs, the objective is always to made the catch wild. Like through the legs, behind the back or with a somersault. Victor, a 5-9, 168-pound quarterback, has watched Chase make those types of plays since they met as teammates for the Evergreen Bulldogs. The Pop Warner team won the 2012 Northwest Regional Championship and traveled to Florida to compete in the Division II Pee Wee Super Bowl tournament. The Bulldogs didn’t win, but it helped set the winning mentality. It wasn’t without adversity their senior season. Union offensive lineman coach Mark Rego left the team after a Week 3 win against Eastlake because of complications with lung cancer. He died in October, and the team dedicated the season to Rego. Victor completed 172 of 242 passes for 2,546 yards with 26 touchdowns and eight interceptions. Victor rushed for another 755 yards on 86 carries with 10 touchdowns. Chase capped his high-school career with 1,004 yards on 65 catches with 14 touchdowns. He’ll play for Nebraska next season while Victor is being projected as a receiver in college and has five offers at the position, including his native Hawaii. QB: Cale Millen, Mount Si, 6-3, 190, Sr. The Oregon commit completed 75.9 percent of his passes for 3,807 yards with 51 touchdowns and seven interceptions. Also rushed for 453 yards. WR Jonny Barrett, Mount Si, 6-3, 180, Sr. Broke school records for receiving with 95 receptions for 1,568 yards, scoring 28 touchdowns and was named the KingCo 4A Crest Division co-MVP. WR Sawyer Racanelli, Hockinson, 6-3, 195, Jr.
Set a title-game record with five rushing touchdowns. His 101 receptions are fifth most in state history. Had 1,662 yards and 23 TD catches. RB Dontae McMillan, Chief Sealth, 5-11, 185, Sr. The Metro League Sound Division’s MVP and first-team linebacker rushed for 2,019 yards with 38 touchdowns. Had a total of 42 TDs. 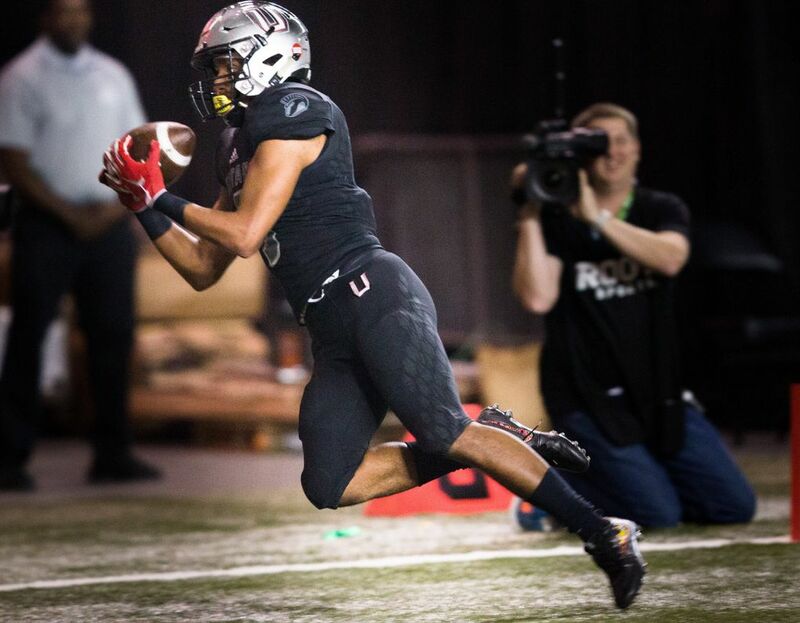 RB Jojo Siofele, Union, 5-10, 205, Sr.
Had big showing in state title game, and for the season he totaled 946 yards with nine TDs rushing and 867 yards and 10 TDs receiving. TE Evan Mannes, Glacier Peak, 6-5, 210, Sr. The all-WesCo 4A first-team pick had 43 catches for 649 yards and 10 touchdowns for the Grizzlies. OL Patrick Utschinski, Walla Walla, 6-7, 280, Sr. The Washington State commit was named to the Mid-Columbia Conference first-team. OL Logan Bruce-Jones, Lake Stevens, 6-5, 295, Jr. Helped the Vikings to a Class 4A state tournament runner-up finish and sixth straight WesCo 4A league title. OL Nathaniel Kalepo, Rainier Beach, 6-6, 329, Sr. The Washington commit finished his high-school career by helping the Vikings reach the Class 3A state tournament in back-to-back seasons. OL Alan Fisher, Lakes, 6-5, 220, Sr. Selected as the Pierce County League Lineman of the Year; the two-way player had 30 tackles and seven sacks. OL Carter Cole, Snohomish, 6-3, 285, Sr.
Captained a line that helped the Panthers win the WesCo 3A championship and first state tournament berth since 2007. K Blake Glessner, Woodinville, 6-1, 155, Jr.
Named to the KingCo 4A first-team after nailing 14 of 17 field goals and 36 of 36 PATs, the longest field goal was 47 yards. ATH Sam Adams II, Eastside Catholic, 6-2, 200, Jr. The Metro League Mountain Division’s Offensive MVP scored 22 touchdowns, including a 48-yard punt return in the Crusaders’ Class 3A state title win. DL Dylan Lewis, Woodinville, 6-4, 240, Sr. The KingCo 4A Crown Division’s Defensive MVP totaled 69 tackles — 19 for a loss — and five sacks for the state tourney semifinalists. DL J.T. Tuimoloau, Eastside Catholic, 6-5, 277, So. Named the Metro League Mountain Division’s co-Defensive MVP, totaling 60 tackles, six sacks, one fumble recovery and one blocked punt. DL Alexx Schmidt, O’Dea, 6-2, 275, Sr. Helped the Fighting Irish reach the Class 3A state championship game for a third straight season, accounting for 43 tackles, two sacks and one blocked punt. DL Giovonni White, Lincoln, 6-3, 290, Sr. The Pierce County League MVP had 65 tackles, nine sacks, two fumble recoveries and an interception as a fourth-year starter. LB Orin Patu, Rainier Beach, 6-4, 200, Sr. The Cal-commit was named to the Metro League Mountain Division first-team as the Vikings reached the Class 3A state quarterfinals. LB Danny Uluilakepa, Puyallup, 6-0, 210, Jr. Helped the Vikings reach the Class 4A state tournament semifinals with 182 total tackles, four interceptions and one sack. LB Kameron McKee, Enumclaw, 6-2, 200, Sr. The North Puget Sound League leader with 87 solo tackles — 22 for a loss — and six sacks. Also scored four rushing touchdowns. LB Jaymason Willingham, Steilacoom, 6-3, 215, Sr.
With 15 sacks and 124 total tackles — 22 for a loss — the Utah State-commit was named South Puget Sound League 2A Defensive MVP. DB Kasen Kinchen, Lake Stevens, 5-11, 165, Jr. The two-way player helped the Vikings reach the Class 4A state championship game, racking up seven interceptions, returning one 65 yards for a score. DB Mishael Powell, O’Dea, 6-1, 185, Sr. Selected to the Metro League Mountain Division’s first-team, totaling 52 tackles, five interceptions and one blocked one punt. DB Ayden Hector, Eastside Catholic, 6-1, 187, Jr. The Class 3A state champ scored three touchdowns on interception returns, blocked four punts, had a fumble recovery and recorded two sacks. DB Jake Wright, Liberty, 5-11, 190, Sr.
Had 44 tackles, four interceptions and scored 14 touchdowns en route to being named KingCo 2A/3A Offensive co-MVP and first-team safety. P Elijah Perez, Chiawana, 5-11, 185, Sr. The two-time Mid-Columbia Conference first-team pick helped the Riverhawks win a league championship.